Like the ingenious hidalgo Quixote I have time to read and travel. Mostly I read in English but I also enjoy reading Spanish language novels. 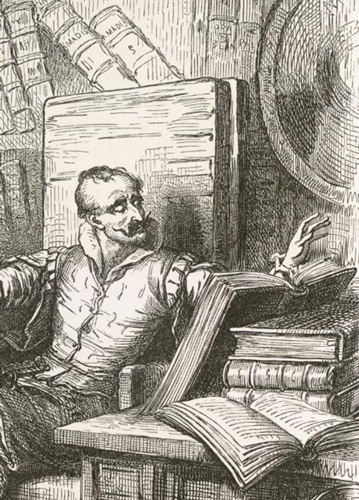 My travels are usually less adventuresome than Quixote’s. Toward the end of 2010, I went through my library with the goal of selecting books to give to the Friends of the Library so that some of the clutter would disappear. The painful process was documented on this blog by posting the daily counts of books saved or recycled and by adding a few reflections on the joys of reading. Looking at my “cleaned-up” library in January of 2011, I decided to read/reread the books in my library, and to write a little about the experience. Two things I love to do as well reading and traveling, hoping I find time to do both😊 thanks for passing by. I know the feeling! I purged several hundred over the last two years. It broke my heart but it had to be done.